"Things must change." Gazing from the dizzying heights of the Spire, the highest and most regal point in all Strathclyde, His Supreme Eminence Oliver Mazsao, Patriarch of the Eastern Sun Emirates, was tired. Indeed, too much blood had been spilled in his name, and the sorrow of it all was overwhelming. The Masao name was now spat upon by his own people, even his own sister. The Free Emirates, glorious and despicable in their defiance, stood as proof positive that his own rule would end in flames. But there was hope for the future, one rebel who held the secret to redemption for the name of Masao. He simply needed to be told. Hope returning to his heart, the Patriarch stepped away from the window. The crouched slave whose back he had been standing upon remained silent, despite his aching muscles. 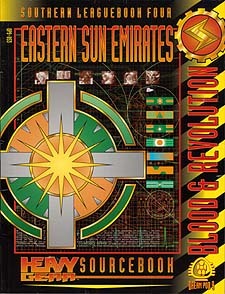 From the most extravagant palaces on Terra Nova to the most dangerous jungles, the Eastern Sun Emirates is a land of many contrasts. This Leaguebook gives Heavy Gear Players and Gamemasters complete information on the most beautiful, and most brutal, of Terranovan nations. As war rages across the planet, some emirs rebel against the mad Patriarch, and in so doing they hold the destiny of their entire planet in their hands. Against a backdrop of excess, revolution and blood-sports, the future of Terra Nova is being written.